The 21st Century skills discussion and debate has waged on even prior to the onset of this century. The ensuing conversations have provided an opportunity for schools, districts, and organizations to critically evaluate what students need to know and be able to do in order to succeed in the new world of work. As we have moved further into this century the number 21 has less of a meaning, but the skills are still important. Thus, many educators, including myself, now refer to these as essential skills. Over time they have evolved beyond just communication, collaboration, creativity, and global awareness to include entrepreneurship and emerging technological proficiency. The other day I was speaking with Rose Else-Mitchell, a wickedly smart educational leader, who pushed my thinking on the whole skills conversation. As I was reviewing a talking point for a webinar that I was to facilitate later in the day, I brought up this image and discussed the skills that students needed to be critical thinkers in the 21st Century and beyond. After looking at what I had on the slide and listening to my analysis, she commented that I was (or should be) referencing and explaining competencies, not just skills, which students will need. This really got me thinking. As I reflected on her feedback I began to dive deeper into what the difference is between competencies and skills as well as their implications on learning. 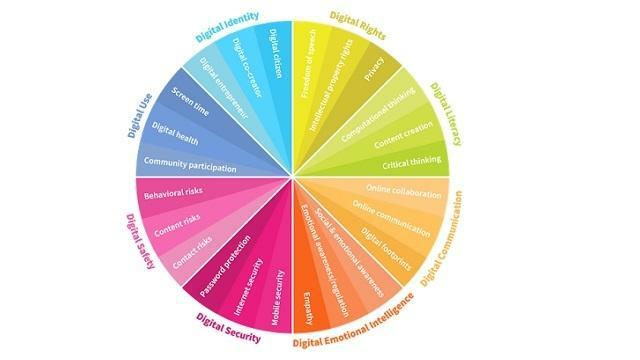 Below is an image that until my conversation with Rose I would have just viewed as another catchy way to visualize digital skills that students (and adults) need. However, I am now more focused on how we can begin to address these as competencies to really prepare students for success in a disruptive world. While skills are an important part of learning and career paths, they’re not rich or nuanced enough to guide students towards true mastery and success. Skills focus on the “what” in terms of the abilities a student needs to perform a specific task or activity. They don’t provide enough connection to the how. Competencies take this to the next level by translating skills into behaviors that demonstrate what has been learned and mastered in a competent fashion. In short, skills identify what the goal is to accomplish. Competencies outline "how" the goals and objectives will be accomplished. They are more detailed and define the requirements for success in broader, more inclusive terms than skills do. There is also an increased level of depth that takes into account skills, knowledge and abilities. To succeed in the new world of work, students will need to demonstrate the right mix of skills, knowledge, and on-the-job ability. A skill is a practical or cognitive demonstration of what a student can do. Competency is the proven use of skills, knowledge, and abilities to illustrate mastery of learning by solving problems. In order to really see the difference between a skill and competency I came across this great communication example provided by HRTMS. A person can become a good presenter through practice, learning from others, and education but in order to be a strong communicator one must rely on a combination of skills PLUS behavior and knowledge. A person can learn how to be a good presenter but only a strong communicator has advanced language skills, the knowledge of diverse cultures, and behaves patiently when communicating. In short, skills are specific learned activities like mopping the floor, using a computer, and stocking merchandise, while competencies are skills + knowledge + behavior like problem solving, communication, or professionalism. Competencies, therefore, may incorporate a skill, but are much more than the skill. They include a dynamic combination of abilities, attitudes, and behaviors, as well as knowledge that is fundamental to the use of a skill aligned to a learning outcome. The Rigor/ Relevance Framework helps us move from a focus on skills to competency-based learning. The acquisition and application of diverse skills is foundational, but moving to Quad D requires the use of skills, knowledge, and abilities to illustrate cognitive growth and authenticity through solving real-world problems that are unpredictable in nature. Success in a digital world will rely on much more than skills. It's time to shift our focus an energy on developing and assessing core and innovative competencies that will serve all students now and in the future. Eric Sheninger is a Senior Fellow and Thought Leader on Digital Leadership with the International Center for Leadership in Education (ICLE). Prior to this he was the award-winning Principal at New Milford High School. Under his leadership his school became a globally recognized model for innovative practices. His work focuses on leading and learning in the digital age as a model for moving schools and districts forward. This has led to the formation of the Pillars of Digital Leadership, a framework for all educators to initiate sustainable change to transform school cultures. Eric has received numerous awards and acknowledgements for his work. He is a CDE Top 30 award recipient, Bammy Award winner, NASSP Digital Principal Award winner, PDK Emerging Leader Award recipient, winner of Learning Forward's Excellence in Professional Practice Award Google Certified Innovator, Adobe Education Leader, and ASCD 2011 Conference Scholar. A frequent blogger, Eric is also the author of Digital Leadership: Changing Paradigms for Changing Times and his latest book: Uncommon Learning.